It’s time to switch to a 21st century telecom solution. Telephony has been held hostage by big telcos long enough. REX was built from the ground up by software pioneers to let you manage company calls the way you want, not the way your telco wants. 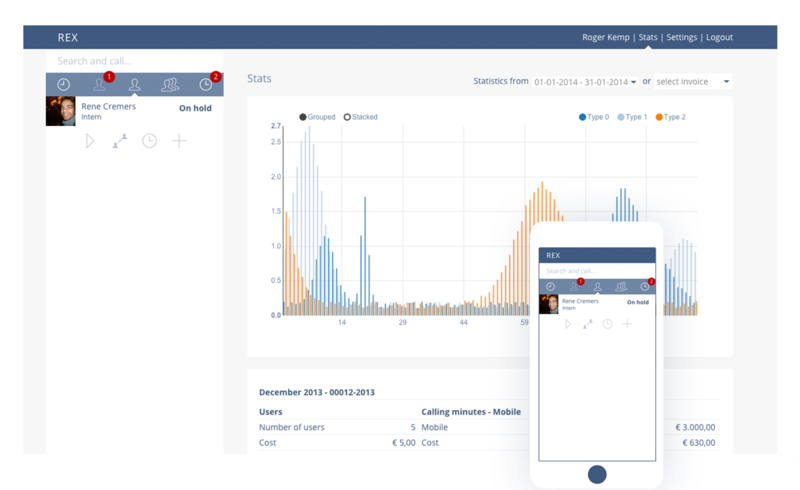 REX is a telecom solution that makes calls in your company more tangible. REX gives you access to your calls, call history, call logs and notes, as well as administration of users and phone numbers. Easily add or remove phone numbers as calling demand changes. Aside from these features, REX gives you a complete picture of your organisation's call usage and cost, on desktop, tablet and mobile devices. The REX WebApp is your default interface to interact with REX. You can easily make and manage calls through the interface, add notes to calls, and review your call history and voice logs. As a manager you have an overview of all active calls, are able to listen in, or take over, calls from other users. You have the ability to add or remove users and phonenumbers as demand changes. You don't need the WebApp to be able to make calls through REX. You can use regular headsets or phones if that suits your organization better. 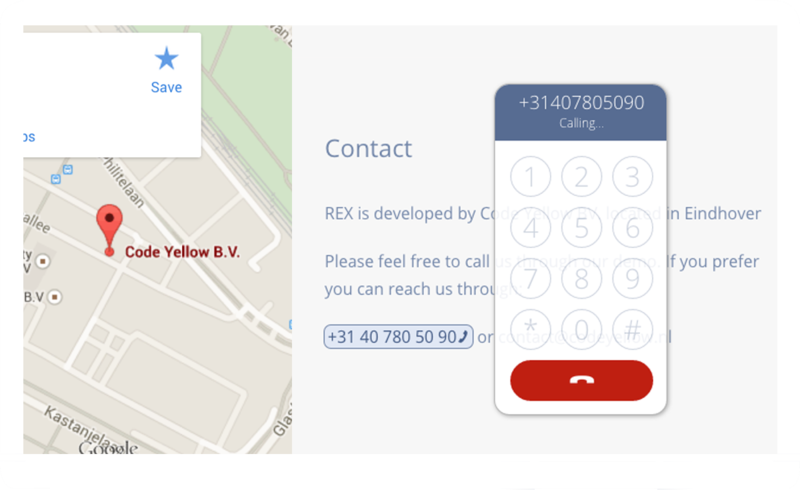 The REX Browser Extension alows you to call any number available on any page or app inside your browser window. Just log in and start calling right away. You can use your existing hardware to make the calls. Easily install the extension from the Chrome Web Store. REX hardware is the perfect complementary solution to the REX Communication Suite. Our high-end hardware allows you to make calls in the most comfortable fashion with excellent ergonomics and high quality audio. Call us while testing REX to learn more about our hardware offerings. You can also email us or give us a call at +31 40 780 50 90. REX is developed by Code Yellow BV. located in Eindhoven, The Netherlands.